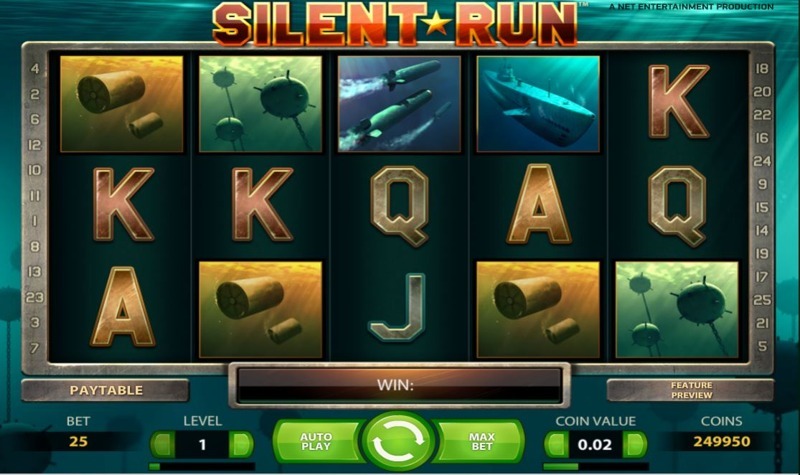 Silent Run is a confusing game for many Net Entertainment players; it bears a striking resemblance to Creature of the Black Lagoon, not so much in terms of the game’s theme, or the symbols… but more in the way the background is designed, and the way the game plays out… and while there have been a few player’s moan about the similarities, Silent Run is actually a fantastic game of its own, and has become a big hit with Net Entertainment players. Themed all around the lonely, claustrophobic world of Submariners, from the moment you open up the game you’re transported into a murky, dirty water, where you’ll see a selection of symbols, including Mines, Battleships, Torpedoes, and Depth Charges. These make up the high-paying symbols, and the low-paying symbols are depicted by the lower-paying playing card symbols, including 10, Jack, Queen, King, and Ace. The game has a strong WW2 feel to it, although Net Entertainment dispute that, saying it’s designed around the late 50’s; whatever the truth, it certainly looks as though it could be from the 1940’s, and while the graphics are far from some of Net Entertainment’s best, there’s something about Silent Run that manages to captivate you from the moment you play. It could be the fact that it’s available to play on almost all mobile phones and tablet devices, and this is thanks to the Net Entertainment development team, who employ state-of-the-art technology to ensure iOS, Android, Blackberry, and Android users can all load, play, and enjoy Silent Run absolutely hassle-free. 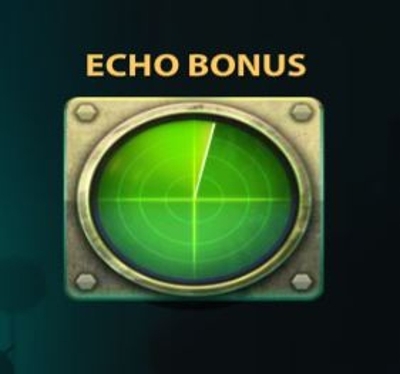 If you manage to land one of the Green Echo Bonus symbols on reel three, you’ll then enter directly into the Silent Run bonus-round. This features different stages, and in stage number one, you’ll see the Echo symbol fire out a selection of sonar signals, in an attempt to detect missiles, and protect the Submarine’s crew. Each torpedo the sonar signal manages to find adds to a tally, and to advance to the second stage, you need two or more tornadoes to be found. During the second stage, it’s not your turn to take the helm, and get in on the action, and you’ll be in charge of taking down enemy combatants, using state-of-the-art missile technology. Every time you fire a torpedo, you’ll notice it has a multiplier value attached alongside it, and if you manage to hit a ship with the missile, you’ll be awarded a large cash prize, with the multiplier multiplying the win there and then. 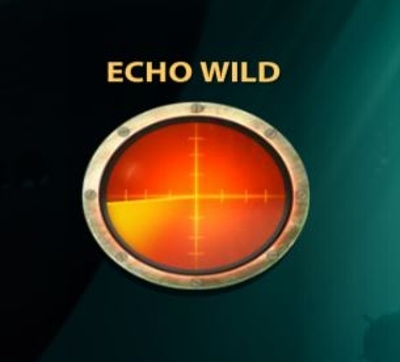 The second bonus-round in Silent Run, Echo Wild is triggered by landing the red Echo symbol on the third reel. This symbol is much smaller than the Green one, and while they both land in the same place, there are substantial differences (aside from the colours), so you won’t get confused, don’t worry. Once you manage to land this bonus-round, you’ll again see a sonar signal on your screen, but instead of searching for enemy tornadoes, it searches for hidden Wild Symbols on the reels, and any it finds, become instantly active, helping aide towards wins as the reels stand.